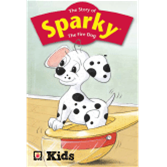 The Story of Sparky the Fire Dog tells the tale of how Sparky® found his calling as the world's most famous fire dog. This bright and colorful children's book is sure to be a favorite of young audiences just starting to learn the basics of fire safety and prevention. The Story of Sparky the Fire Dog is easy to follow and teaches the valuable lesson of taking action in the case of a fire emergency. Kids will fall for the National Fire Protection Association®'s irresistible mascot while being inspired by the care and compassion our hero shows the characters in the story who are put in harm's way. The perfect size for little hands, this fun storybook is sure to have a lasting impact on kids.